星を追う子ども (Children Who Chase Lost Voices from Deep Below) is a 2011 Japanese anime film directed by Makoto Shinkai. 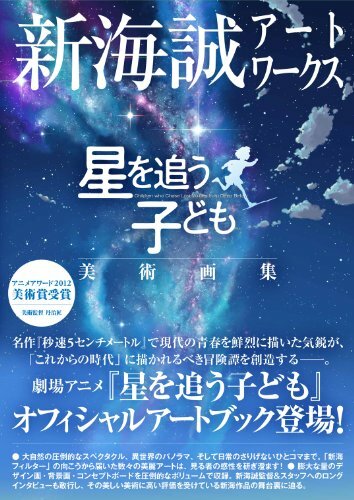 And the book title if I translated it correctly is Makoto Shinkai Art Works: Children Who Chase Lost Voices from Deep Below Artbook. It comes with a thin cardboard slipcase that's printed vertically. The softcover book is actually in landscape format. There are 192 pages in total. The packaging design is similar to the earlier book 新海誠美術作品集 空の記憶 ~ The sky of the longing for memories ~. The bulk is on background paintings for the film. There are also some character designs, props, storyboards and 3D pre-vis shots. A few artists painted the backgrounds for the film and they sure did an amazing job getting the colour scheme consistent. They aren't credited for each painting but their interviews are included. The background art are gorgeous. There are 140 pages filled with them in various sizes. The lighting, colour and mood are great. Subject matter however may seem a bit familiar, like railway tracks, countryside Japanese town and school. It seems like the world is perpetually in sunset time as the clouds are bathed with beautiful pink and purple glow, farm fields are in various shades of pastel colours, the sky is either charming blue or filled with stars and auroras. There's a short 3 page look at the Photoshop brushes that created the different effects in the paintings. As the story moves to the hidden world, the settings takes on a more old school fantasy feel. There are fallen towns and wide savanna. This is a book with great art works for those who like Japanese scenery and anime background art.